Ichigo wakes up to find that all his wounds have healed, and a familiar reiatsu lingers in his room. Before he can speak his thoughts, Hitsugaya summons Ichigo to an emergency meeting concerning Orihime and her whereabouts. When the spirit reception is fixed, Ukitake appears on screen to deliver bad news to those in the real world – Orihime has either defected to the Arrankaru’s side, or was killed on the way to the real world. This only makes Ichigo more angry, but Renji stops him and volunteers to go to Hueco Mundo to retrieve Orihime. 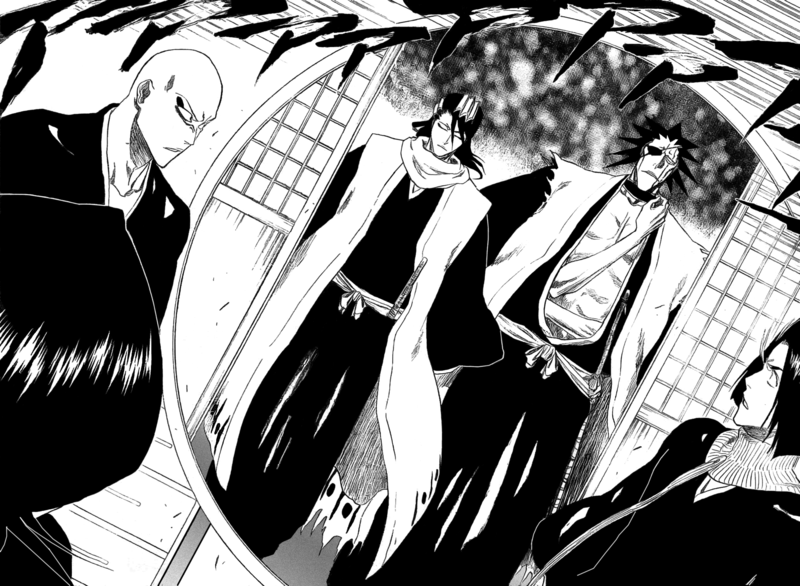 Yamamoto doesn’t allow this, and Bakuya and Kenpachi shows up to enforce his orders for the Shinigami to return to Soul Society to further prepare for the up-coming crisis. Ichigo asks for the way into Hueco Mundo, but Yamamoto refuses to tell him – he’s far too valuable a force to be lost in reckless attacks. The chapter closes as the Shinigami departs, and Ichigo is left all alone in Orihime’s apartment. It seems I’m far too short-sighted and dumb to notice it, but the real reason for why Aizen allowed Orihime a grace period is revealed in this chapter. It gives the impression that she voluntarily joined the Arankaru. Not only does this destroy the Shinigami’s trust for her, but it also creates a rift in the good guy’s ranks. Ichigo is bound to go after her, and along with him probably Sado and maybe even some Shinigami. The Shinigami can’t go, but Aizen has already successfully created a barrier between the Shinigami authority and Ichigo. Yamamoto’s character fits that of a commander of an elite military unit. He appears harsh and cold, but the flip side of these “bad” emotions is the ability to make fair and logical judgements without letting personal emotions get the better of him. Ichigo completely fails on this front, as we see him time and again recklessly throw himself into the way of danger. Yamamoto explains his decision with the words “There is no need to put a single life and the whole world on a scale”, and these words justifies his position as the Commander of the Shinigami. Perhaps we’re supposed to get the impression that Yamamoto is ‘bad’, but I think that is what being a leader is all about – to be able to select the best course of action when you’re faced with nothing but undesirable choices. People tend to value compassion and ethics more than they are worth, and posterity has often punished those who have made the choices that needed to be made. I however think those people are neccessary for the continued posperity of mankind. It’s all well and good to be compassionate when things are going smoothly, but when forced to do so a leader must be able to make the decision that benefits the people as a whole. After all, sometimes the end does justify the means. bagaimana akhirnya ichigo dan orihime?